A Bangladeshi photographer named Abir Abdullah has documented the tragic aftermath of Nepal’s catastrophic earthquake that devastated large areas of the country and killed over 10,000 people. Photographer Abir Abdullah travelled to Nepal right after the 7.8-magnitude quake hit the country on April 25 and took photographs of huge swaths of land and road and buildings as well as the survivors as they struggle to cope with the aftermath of the disaster. The photographs, numbering 95, are put on display at the Gallery Chitrak in the city’s Dhanmondi area as part of a weeklong exhibition that inaugurated on June 5. 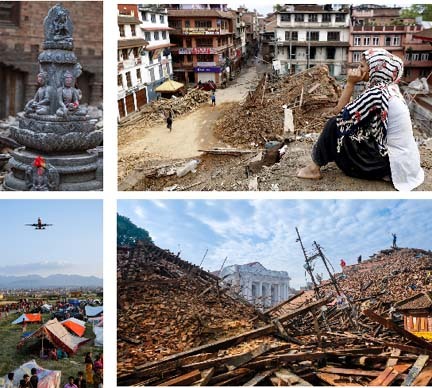 Titled ‘Nepal: Resilience and Reasons,’ the exhibition featured moving images of a once-beautiful country torn apart by the deadliest natural disaster in its history of over 80 years. Abir Abdullah mentioned that he went to Nepal on April 26 and got back on May 4. The highlight of the exhibition, however, is an assortment of broken bricks and concrete and other things collected from quake-hit areas and put on display at the exhibition gallery, as well as a video projection of the devastated country meant to give the visitors a feel of the present-day Nepal. The images are replete with scenes of destruction, rubble, remains of collapsed buildings, and of tales of survival and heartache. In one of the photographs visitors can see a bird's-eye view of Nepal post-earthquake, showing the devastating impacts of the disaster with not a single structure left unaffected, temples and buildings and streets all bearing scars of the devastation. Another photograph shows a woman looking pensively at a destroyed structure, her back turned to the camera, possibly reflecting on the extent of the damage caused in her neighbourhood.